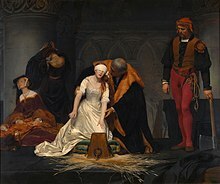 The death of Lady Jane Grey, who served as de facto Queen of England for nine days in 1553 before relinquishing the throne to Mary Tudor; Queen Mary later charged Lady Jane Grey (among others) with high treason. Who owes his greatness to his country's ruin? Thomas Dekker, The Honest Whore (1604), Part I, Act IV, scene 4. T. S. Eliot in Murder in the Cathedral (1935). E. M. Forster, Two Cheers for Democracy (1951). Thomas Fuller, The Holy State and the Profane State (1642), The Traitor. Sir John Harington, Epigrams, Book iv, Epistle 5. Compare: "Prosperum ac felix scelus/ Virtus vocatur" ("Successful and fortunate crime/ is called virtue"), Seneca, Herc. Furens, ii. 250. With vizor'd falsehood and base forgery? John Milton, Comus (1637), line 697. The trusting bosom, when betray'd. Thomas Moore, Lalla Rookh (1817), The Fire Worshippers. And blasts them in their hour of might! Thomas Moore, Lalla Rookh (1817), The Fire-Worshippers. Mort Sahl, "Live at the hungry i" (1960 comedy album). To the ensuing age abhorr'd. William Shakespeare, Coriolanus (c. 1607-08), Act V, scene 3, line 145. William Shakespeare, Cymbeline (1611), Act III, scene 4, line 87. William Shakespeare, Henry IV, Part I (c. 1597), Act III, scene 2, line 52. William Shakespeare, Henry IV, Part I (c. 1597), Act V, scene 2, line 9. William Shakespeare, Henry IV, Part II (c. 1597-99), Act IV, scene 2, line 122. That admiration did not hoop at them. William Shakespeare, Henry V (c. 1599), Act II, scene 2, line 105. William Shakespeare, Henry VI, Part II (c. 1590-91), Act III, scene 1, line 53. And cried "all hail!" whereas he meant all harm. William Shakespeare, Henry VI, Part III (c. 1591), Act V, scene 7, line 33. Et tu Brute! Then fall, Cæsar! William Shakespeare, Julius Cæsar (1599), Act III, scene 1, line 77. William Shakespeare, King Lear (1608), Act V, scene 3, line 121. William Shakespeare, Richard III (c. 1591), Act III, scene 4, line 77. "Off with his head! so much for Buckingham!" As altered by Colley Cibber. Peter Stone and Sherman Edwards' musical 1776 (character of Benjamin Franklin). All men should have a drop of treason in their veins, if the nations are not to go soft like so many sleepy pears. Dame Rebecca West, "The Meaning of Treason" (Revised edition, Penguin Books, 1965), Conclusion, p. 413. Quotes reported in Hoyt's New Cyclopedia Of Practical Quotations (1922), p. 811-12. Cicero, Orationes In Verrem, II. 1. 15. John Dryden, Medals, line 207. Fell from the patriot's heaven down to the loyalist's hell! Thomas Dunn English, Arnold at Stillwater. And whistle in rude fury round his ears. Sir John Harrington, Epigrams, Book IV, Epigram V.
Matthew Henry, Commentaries, Matthew, XXII. Tarquin and Cæsar had each his Brutus—Charles the First, his Cromwell—and George the Third—("Treason!" shouted the Speaker) may profit by their example. If this be treason, make the most of it. Halts on a quicksand, the first step engulfs him. Aaron Hill, Henry V, Act I, scene 1. The traitor still I love. John Hoole, Metastatio, Romulus and Hersilia, Act I, scene 5. Than be true to Church and State while we are doubly false to God. He [Cæsar] loved the treason, but hated the traitor.